Excerpts From the Book: Flora of Los Angeles and Vicinity, LeRoy Abrams, 1904. Pinus torreyana. Del Mar, San Diego County; Santa Rosa Island. Typha latifolia. Frequent throughout our range along the margins of marshes or slow-running streams. T. angustifolia. In similar places, but not common. Near Los Angeles, Davidson; San Bernardino, Parish. Potamogeton natans. Bear Valley, San Bernardino Mountains. Not known within our limits. P. lonchites. Occasional in ponds in the valley region. P. foliosus californicus. Occasional in streams and irrigating ditches in our interior valleys. June-September. P. pectinatus. Common in streams and ponds. May-August. Ruppia maritima. Brackish streams along the coast. June-August. Zannichellia palustris. Occasional in marshes and ponds. Naias flexilis. Near Soldiers Home, Hasse, Davidson. Zostera marina. Shoal waters in bays on muddy bottoms. San Pedro. Phyllospadix torreyi. Growing on rocks which are uncovered at low tide. San Pedro; La Jolla. Family 4. Juncaginaceae. Triglochin maritima. Salt marshes along the coast. Lilaea subulata. Occasional about San Bernardino, Parish. Frequent about San Diego and in the Cuyamaca Mountains. Family 5. Alismaceae. Echinodorus cordifolius. Occasional along streams and banks of ponds. May-July. Sagittaria latifolia. Occasional on margins of ponds of Los Angeles. Family 6. Gramineae [Poaceae] 6.8.2 Phalaris lemmoni. Rather local. ... Collected by the author at Inglewood, so far the only known locality for it in southern California. 6.36.14 Bromus carinatus californicus. Occasional in coast valleys. Ballona Creek near Mesmer. 6.38.1 Lepturus cylindricus. Occasional along borders of salt marshes toward the coast. Mesmer; Wilmington; Oceanside. 6.39.2 Agropyron parishii laeve. Ballona Creek, near Mesmer; Santa Ana Mountains; San Bernardino Mountains. ... Cuyamaca Mountains. 6.42.4 Sitanion anomalum. Ballona Creek, near Mesmer, and on the South Fork of the Santiago Creek, Santa Ana Mountains. Family 7. Cyperaceae. Carex siccata. Common on borders of marshes throughout our ranges. Cienega; Ballona; Santa Ana; San Bernardino. Scirpus robustus. Common in marshes, especially in somewhat saline places. June-October. Family 13. Saururaceae. Anemopsis californica. Frequent in wet saline places throughout our range. March-August. Family 14. Juglandaceae. Juglans californica. Confined mostly to the foothills below 3000 feet. Frequent in the Santa Monica Mountains and Puente Hills, less so on the southern borders of the San Gabriel, San Bernardino, and Santa Ana Mountains. Family 15. Myricaceae. Myrica californica. Rustic Canyon near Santa Monica, Hasse. Atriplex patula. Frequent in saline places, especially toward the coast. Atriplex expansa. Occasional in the Ballona Marshes. Atriplex microcarpa. Rather common in saline places toward the coast. Atriplex californica. Occasional in saline places along the coast and on sandy bluffs overhanging the sea. Atriplex breweri. Bluffs along the seashore. Port Los Angeles; Santa Monica; Port Ballona. Family 35. Cruciferae [Brassicaceae]. Cheiranthus suffrutescens. Common on the sand-dunes along the seashore. Flowering nearly the year round. Dithyrea californica maritima. Occasional along the seashore between Redondo and Port Ballona. Hutchinsia procumbens. In moist saline places throughout our range. March-April. Lepidium lasiocarpum. Sand-dunes along the seashore. Lepidium acutidens. In saline places toward the coast. Cienega; Santa Monica. Family 36. Capparidaceae. Isomeris arborea. Frequent on bluffs and hills along the coast, Ballona Harbor; San Pedro; San Joaquin Hills. February-July. Family 41. Rosaceae. Rubus vitifolius. (Bramble or Blackberry). Frequent in the foothills and valleys, mostly along streams. January-April. Potentilla multijuga. Ballona, Hasse. Apparently a rare plant not otherwise known. Argentina anserina. Rather common in damp ground in the valleys. Flowering throughout summer. (Potentilla anserina). Horkelia sericea. Near Port Ballona, not otherwise known south of Santa Barbara. March-May. Alchemilla arvense. Occasional in shady places or along streams in the foothills. Rosa californica. Frequent throughout our range both in the valleys and mountains. Flowering often nearly the year round. Family 42. Leguminosae [Fabaceae]. Prosopis juliflora. Algaroba or Mesquit. River bottoms about San Bernardino. Common on the Colorado Desert. Prosopis pubescens. Tornilla or Screw-bean. River bottoms about San Bernardino, with the last. Lupinus longifolius. Frequent in the foothills and on bluffs along the seashore, but not on the dunes. (L. chamissonis longifolius Wats.). Lupinus chamissonis Esch. Common on the sand-dunes along the seashore. Flowering nearly the year round. Lotus lathyroides. Along streams near Los Angeles and in San Gabriel Canyon. Lotus grandiflorus. Rustic Canyon, near Santa Monica, Hasse. Astragalus pycnostachys. In moist subsaline soil near the sea. July-September. Astragalus brauntoni. Occasional in dry places in the Santa Monica Mountains, Hasse, Braunton. Family 54. Malvaceae. Modiola caroliniana. In rather low moist places. El Monte; Santa Anita. Malva parviflora. A common vernal weed. Malva pusilla. Known within our region only from low ground along Ballona Creek, near Mesmer. Sida hederacea. Common in subsaline places. May - September. Family 56. Elatinaceae. Elatine sp.? Occasional along borders of ponds toward the coast. Family 57. Frankeniaceae. Frankenia grandiflora. Common in saline marshes. Flowering all summer. Family 59. Violaceae. Viola palmata cucullata. In swamp lands about Los Angeles, Davidson. Family 60. Loasaceae. Mentzelia gracilenta. Frequent on the plains and foothills and also on the sand - dunes along the seashore. Family 64. Onagraceae. Jussiaea californica. In stagnant water or muddy bottoms, in marshes toward the coast. Cienega; Mesmer; Alamitos. Epilobium californicum. In marshes near the coast. Cienega, Davidson. Alamitos. Boisduvalia glabella. Low ground. Santa Monica; Mesmer; San Diego. July - October. Family 67. Umbelliferae [Apiaceae] Eryngium parishii. In low heavy ground toward the coast. First collected by Parish near Oceanside. Family 68. Cornaceae. Cornus occidentalis. Occasional in moist ground, especially in the mountains, but reported from Cienega by Davidson. Family 70. Ericaceae Arbutus menziesii. ... and in Las Tunas Canyon, Santa Monica Mountains. Family 72. Plumbaginaceae. Limonium californicum. Occasional in salt marshes along the coast. Family 77. Convolvulaceae. Convolvulus [Calystegia] soldanella. On the sandy beaches along the seashore. May-June. Family 78. Cuscutaceae. Cuscuta salina. In salt marshes along the coast, growing over Salicornia, etc. Family 79. Polemoniaceae. Linanthus dianthiflorus. 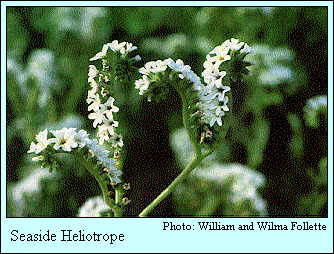 Common in sandy soil in the coast and interior valleys. Family 80. Hydrophyllaceae. Phacelia ramosissimus suffratescens. Common ... on sand-dunes along the seashore. Specimens from Port Ballona show 5 annular rings near base. Phacelia douglasii. Frequent near the coast along the borders of sand-dunes. Much resembling some of the large-flowered Nemophilas. Phacelia fremontii. Los Angeles River; Wilson's Peak Davidson. Santiago Peak. Conanthus stenocarpus. Growing about the borders of ponds. Santa Monica, Davidson; Soldiers Home. Family 82. Boraginaceae. Heliotropium curassavicum. Common in low saline places. Cryptantha leiocarpa. Frequent on the sand-dunes along the seashore. Amsinckia spectabilis. Common in sandy soil near the coast, and apparently passing into the next. Amsinckia intermedia. A very common weed in all the valleys and foothills. Family 83. Verbenaceae. Verbena bracteosa. Occasional in low ground, especially in the bottoms of dried up ponds. June-September. Family 84. Lamiaceae. Scutellaria bolanderi. Moist woods, El Monte, Davidson. Family 86. Scrophulariaceae. Adenostegia maritimus. Occasional in salt marshes near the sea. June-September. Family 93. Solanaceae. 93.1.1 Physalis ixocarpa. Frequent in cultivated fields. June - September. 93.1.2 Physalis greenei. San Joaquin Hills, Orange County; Santa Margarita Ranch, San Diego County... Cedros Island. 93.2.1 Solanum villosum. Occasional in waste places. Soldier's Home. 93.2.2 Solanum douglasii. ... Often appearing as an introduced plant along roadsides and in waste places. 93.2.3 Solanum xanti. Common in all the hills and mountains. 93.2.4 Solanum xanti glabrescens. Occasional in the valleys and foothills, mostly in dry and rather exposed places. 93.2.5 Solanum wallacei. Santa Catalina Island. 93.2.6 Solanum rostratum. Occasional in waste places and along roadsides. Inglewood; Soldiers Home; Santa Monica. Native of Texas. 93.3.1 Lycium richii. A Mexican species reported from Santa Catalina Island. 93.4.2 Lycium californicum. On bluffs near the sea. Redondo; Long Beach; Laguna. First collected by Nuttall at San Diego. 93.4.3 Lycium parishii. Dry mesas in the San Bernardino Valley, Parish; Elsinore, Baker. 93.4.1 Datura stramonium. Introduced at Playa del Rey, Davidson. 93.4.2 Datura meteloides. Frequent in sandy soil throughout our range. July - September. 93.5.1 Nicotiana clevelandi. Sand-dunes along the seashore near Playa del Rey. 93.5.2 Nicotiana bigelovii. Occasional in dry washes about Los Angeles. 93.5.3 Nicotiana glauca. A well-established introduced plant; rather common along streams. Flowering all the year. 93.6.1 Petunia parviflora. Occasional on margins of ponds and along streams, especially in subsaline places. June - August. Family 95. Asteraceae. Baccharis douglasii. Occasional along streams in our coast region. Ballona Creek; Los Angeles River. August-September. Centromadia parryi australis. Brackish flats toward the coast. Helianthus oliveri. Cienega; East Los Angeles. Helianthus parishii. Oak Knoll, Grant. Rather frequent in the San Bernardino Valley. Jaumea carnosa. Common in salt marshes along the coast. Lasthenia chrysostoma. Rather common in open places in our coast valleys and foothills. Port Ballona; Santa Monica Mountains. Lasthenia mutica. In sandy soil along the coast near Port Ballona; common about San Diego. April-May. Lasthenia tenella. Sycamore Grove, Greata. Lasthenia glabrata coulteri. Common in salt marshes, especially along the coast. Pluchea camphorata. Occasional along streams and marshes about Los Angeles; Ballona Creek. Psilocarphus globiferus. Frequentl on the plains and hills, especially in exsiccated places. LeRoy Abrams (1874 to 1956) explored the Los Angeles region and southern California in his search for native plants more than a century ago. He traveled far and wide looking for trees, shrubs, rare plants, and new species in all kinds of different areas from 1898 to 1903. He visited seashores at Ballona, Santa Monica, Topanga, and down the coast to San Diego. He explored the highest peaks of southern California such as Mount Baldy. He explored the deserts, prairies, rivers, and plains of Los Angeles and vicinity. He explored in an era before automobiles and airplanes. He was raised in southern Caliornia, attended USC, then transferred to Stanford University, but he became interested in the flora of southern California as a child and young adult. As a graduate student at Stanford University, he decided on a project that focused on the flora of Los Angeles and vicinity. He travelled by steamship down the California Coast to Port Los Angeles (Santa Monica) and sometimes by railroad down the coastline to downtown Los Angeles. After arriving in Santa Monica and Los Angeles, he traveled via electric trolley car, on foot, and horseback, totaling thousands of miles over the 5 year period. He sometimes would visit his mother in San Diego County, near his boyhood home, while working on his Los Angeles Floristic graduate project. As you can see, from his field journals, early books and articles in scientific magazines, his roots were in southern California. We are fortunate today, in 2004, 100 years after LeRoy Abrams' first Flora was written, to have such a valuable reference guide for ecological restoration and recovery of wild native plants in wild landscapes in various natural settings in Los Angeles and all of southern California. Native plants and sometimes non-native plants too, are the foundational basis for much of the wildlife in southern California. Animals such as birds, butterflies, lizards, frogs, salamanders, mammals, and other fascinating zoological creatures depend on native plants in natural area landscapes. If only we will slow down our lives to listen and see and touch. The art of simple observation, followed by gently recovering and restoring the genuine native flora and native fauna is possible in this geography of hope called Los Angeles and southern California. It would make our ancestors proud, happy and tearful with joy, particularly Le Roy Abrams, to recover genuine native plants that he first recorded over 100 years ago.